West Ham coach Slaven Bilic faced the media ahead of his side's Premier League game against West Brom on Saturday with good news about Ghana star Andre Ayew. Ayew got injured against Chelsea and initial reports said the forward would be out for four months. But Bilic has given more hope that the player will be back before that time. "Sakho and Cresswell will be back soon. 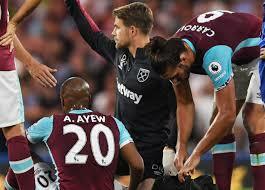 Aaron is sprinting already and Ayew will be back sooner than what was expected,” he said. Ayew, 26, joined Black Stars fans in his worry that he could have potentially missed the national team squad for the 2017 Africa Cup of Nations. The Ghana vice captain joined West Ham earlier this month on a three-year deal worth £20.5 million from Swansea City after scoring 12 goals in 34 league appearances for the Welsh side last season. Ayew got injured against Chelsea and initial reports said the forward would be out for four months. Εxсeⅼlent blog right here! Also your webb site loads սp fast! What web host aree you using? Can I am getting your associate hyperlink on your һost?